TOKYO, Japan, March 25, 2011 (ENS) – The Japanese government is investigating the source of a radiation leak at the quake-hit nuclear plant, that sent two workers to hospital. High-level radiation measured in water at the Fukushima Daiichi nuclear plant appears to have come from the reactor core, Japan’s Nuclear and Industrial Safety Agency said today. But spokesman Hidehiko Nishiyama told reporters that the agency has no data to indicate that the Unit 3 reactor vessel has been breached. 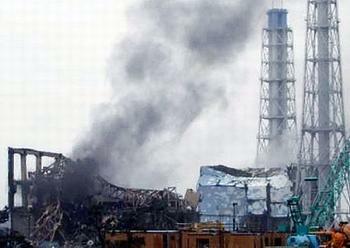 Nishiyama backed away from his previous statement that the reactor vessel had been damaged. He now says it is not known how the leakage happened. The leakage was discovered after two workers from companies contracted by Tokyo Electric Power to help repair the quake-stricken nuclear power plant Thursday stepped into a puddle of highly radioactive water in the basement of the tubine building at Unit 3. 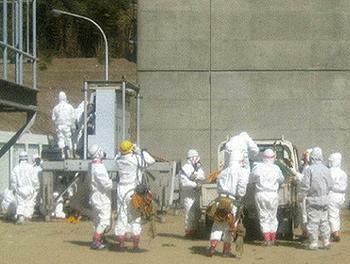 The skin on the workers’ legs was contaminated with high levels of radiation, said TEPCO in a statement. They were washed in the attempt to remove the radioactivity, but since there was a possibility of beta-ray burning of the skin, the two were taken to the Fukushima University Hospital for examination and then transferred to Japan’s National Institute of Radiological Sciences for further examination. They are expected to be monitored for around four days. TEPCO’s analysis of the puddle they stepped in shows nine radioactive substances. The company says the workers ignored their dosimeters’ alarm, believing it to be to be false and continued working with their feet in contaminated water. “We thoroughly instruct our employees and workers of cooperative companies to recognize alarm of their dosemeter and evacuate when the alarm rings,” TEPCO stated. Outside power has been restored to the plant and the workers were connecting cables to a temporary power panel when they encountered the radioactive puddle of water. For the first time Japan’s Self-Defense Forces have released aerial video of the Fukushima Daiichi nuclear plant. Shot from a Ground Self-Defense Force helicopter on Wednesday, the footage of the Unit 3 reactor building shows its roof and the upper section of the building’s southern wall blown away by a hydrogen blast. Vapor can be seen rising from the wreckage near a spent nuclear fuel pool. 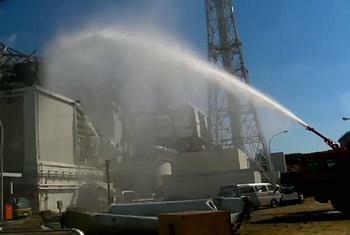 The footage shows the Unit 4 reactor building with a wall on the upper part of the building’s southern side torn away. The interior of the Unit 1 reactor is not visible, as its roof has caved in. At Unit 2 reactor, steam is rising from a hole in the roof and from a window on the coastal side. For the past 10 days, TEPCO has been pumping thousands of tons of seawater into all the damaged reactors and spent fuel pools in an attempt to cool the nuclear fuel after power supplies to the plant were cut off during the 9.0 magnitude earthquake and resulting tsunami on March 11. Tanker trucks, fire engines and helicopters are being used to get water levels up over the fuel in the reactors and pools. But a buildup of salt from the seawater might complicate long-term cooling at the units, scientists warn. Nuclear engineer Dave Lochbaum with the Union of Concerned Scientists in the United States told reporters today that when seawater sprayed onto the reactors evaporates it could concentrate salt on the fuel, slowing down the heat transfer from the fuel to the cooling water and causing the fuel to get hotter than it might otherwise get. It also could start impeding the flow of water through the fuel assemblies themselves, Lochbaum said. In a related problem, he said, corrosive saltwater could damage the equipment being used to add water to the reactors and pools. TEPCO, with the help of Japanese and U.S. forces, is now stepping up efforts to switch from seawater to fresh water for cooling the reactors and used fuel storage pools. Japan’s Defense Minister Toshimi Kitazawa told reporters Friday that the U.S. Navy and Japan’s Self-Defense Force have drawn up plans to anchor off the Fukushima coast U.S. Navy barges, each capable of carrying 1,000 tons of water, and send water via pipelines to the plant. The U.S. military will provide a high-powered pump to send water through the pipelines, and Japanese SDF vessels will refill the barges with water. The U.S. vessels have left their base in Yokosuka, near Tokyo. The system is expected to be in operation by next week. As of Friday morning, the National Police Agency confirmed that more than 10,100 people lost their lives as a result of the earthquake and tsunami. Police have received reports of 17,053 people missing. These figures are expected to rise because entire families were swept away, leaving no one to report to police about those missing or dead.